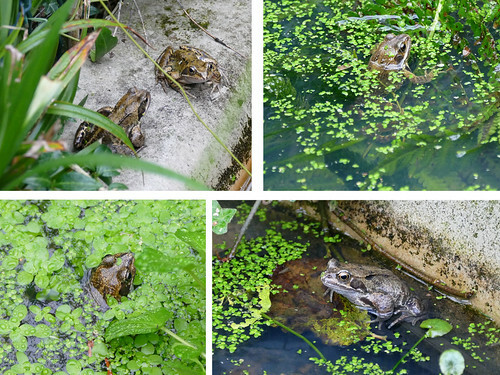 I noticed one frog in the pond yesterday, (and have heard them croaking several times recently.) Today I saw five in and around the pond- it looks like they are coming back to get ready for over-wintering. Poor things! I wouldn't fancy sleeping for four months at the bottom of an iced-over pond, even if I did have antifreeze in my blood! This morning about 3 or 4 frogs in the pond. First ones I've seen so far. They weren't doing much. As the weather is forecast to turn colder I expect any further activity will slow down. Yes, there was a bit of splashing around in our pond yesterday- but if this polar vortex they are prediction does hit next week, they will go back to sleep in the mud at the bottom. Three frogs this morning in amplexus. The frogs have returned to my pond. I hope more will turn up as the two resident Crows have made a meal of them. So far I have seen the Crows take one each from the pond and stood at the side of the pond tearing the frogs to pieces. Found another two corpses on the flower bed. I suspect the Crows are the culprits though I did see a Magpie trying catch one. It didn't succeed. There must have been between twenty and thirty frogs splashing around in the pond yesterday... but today the weather has taken a turn for the worst, and temps have fallen back down to freezing. Snow flurries all day, and the last time I went out to check the birdbath the frogs have all vanished. Five clumps of spawn appeared over the past few days, but I don't expect it to survive this. I suspect a lot of spawn will succumb to this unusually harsh weather for us at least in the south. I did collect some on Friday from a local site where there was masses in an area I suspect will dry up before development is complete. In a bucket in the coolest room of the house until temperatures rise next week. There's now a grand total of eleven clumps out there... so they've been spawning despite the freezing weather! I think I'll try fishing some of it out and put it in a corner of the room where there's a cool draft- I'm sure they'll produce more once the weather warms up, but I hate to lose so much. I went out and picked out about six or seven clumps, and they are now in a bucket. I took this photo several days ago of the first spawn to appear, and these have already dissolved into mush, so I'm hoping I got the rescue clumps out in time. 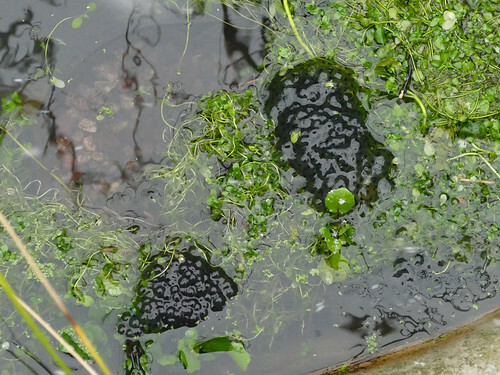 Just seen the first frog spawn in the pond today. Hope the chance of frost is low now and it survives. The spawn I took out of the pond is still sitting in a bucket in the summerhouse... if the temps stay up above freezing for the next few days I think I'll put it back. Lots of activity today- although I wasn't able to get many photos, because every time I go out there they all dive! These are the best I took today. The pond baskets are serving as nurseries for them to spawn in- I put a bag of watercress from the supermarket and any starwort I've weeded out of the pond into each basket, and the frogs all congregate in them. They do tend to kick half the plants out over night, so I spend a few minutes every morning putting it all back again! 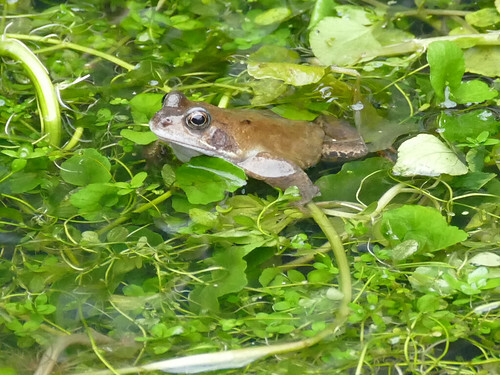 Disappointingly I've only seen one pair of frogs in my pond so far. A few years ago I had about 90! The numbers have been declining + the last couple of years the maximum number seen on any day (the true figure could be higher) has been about 20. I think reproductive success is now low due to the many smooth Newts eating most of the small tadpoles. Looking elsewhere the only place I've seen plenty of frogs (300+) + lots of spawn was the nearby Yeading Brooks meadows. 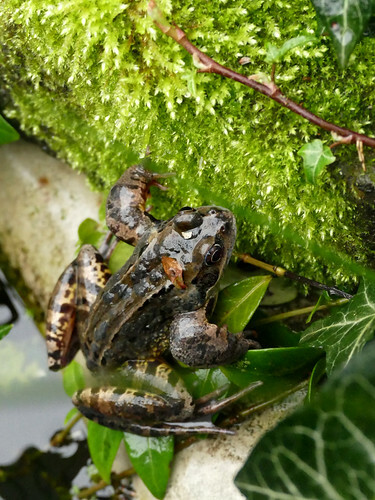 When I was at the Gunnersbury Triangle in the week saw just one pair in amplexus + no spawn + yesterday looked in a good amphibian pond in Richmond Park + no sign of frogs or their spawn. Probably a bit early for the Common Toads that also usually breed here. It's surprising the numbers should drop that drastically within such a short time, Aeshna... do you have a lot of newts? 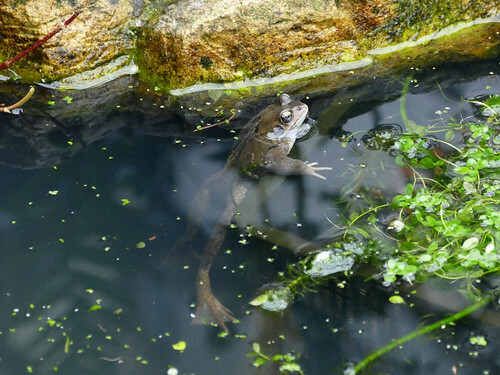 I saw two in our pond today; I think this is the earliest they've reappeared. After having quite a few frogs just a week or so ago, they seem to have gone again. Only three in the pond that I could see today, and the spawn still isn't developing very much. I hope that if we get the promised sunshine on Sunday it might speed things up a bit. Yes I do have quite a few newts. In the past I would see quite a few newly emerged froglets but no more. The tadpoles generally seem to disappear (eaten) though maybe a few go undetected. This has been the first spring when I didn't get the spectacle of lots of frogs splashing around. no obvious signs of disease either.